Corbeau Fixed Back Seat - Baja Low Back UNIVERSAL - Pann Auto Performance - San Diego largest aftermarket automotive performance parts - What do you drive? 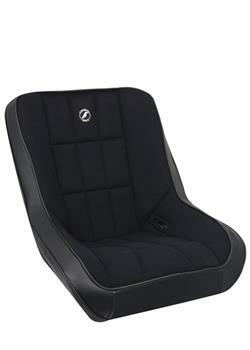 The Baja Low Back seat is a low back version of our ever-popular Baja SS Suspension Seat. This line of suspension seats is one of the most advanced suspension seats available today. The Baja Low Back Suspension Seat was designed for the off road enthusiast who wants the safety of suspension and the comfort of Corbeau. What makes this seat special is the option for an adjustable headrest. The Baja Low Back headrest not only adjusts up and down but will also adjust forward and back, assuring ultimate comfort both on and off road.. As a rule of thumb the Baja Low Back Seat will fit up to a 36-38 inch waist. The Baja Low Back Seat is available in vinyl and vinyl/cloth fabrics. The headrests are available in vinyl only. The headrest option is an additional $49.00 per seat and must be specified at the time of your order. If ordered without headrests, there will not be any headrest holes or grommets in the top of the seat.